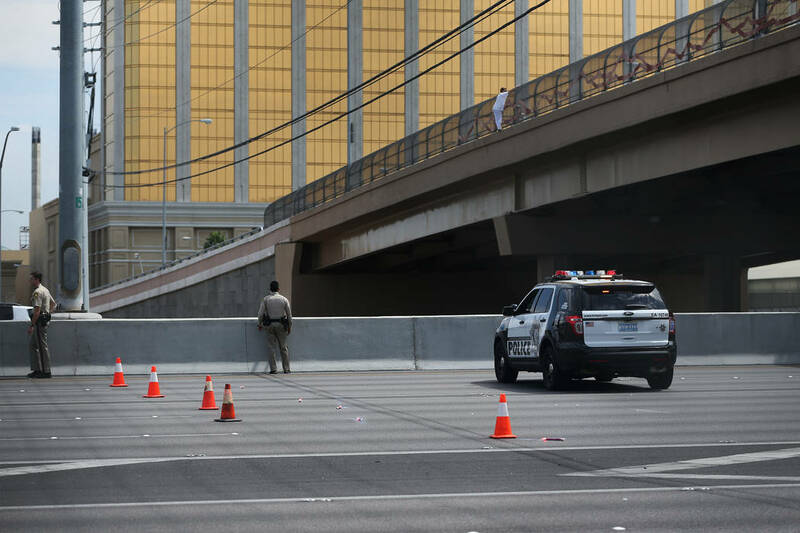 Metropolitan Police Officer Timothy Mullins relied upon his training on Labor Day when a woman appeared ready to jump on the interstate from the Mandalay Bay Road overpass. 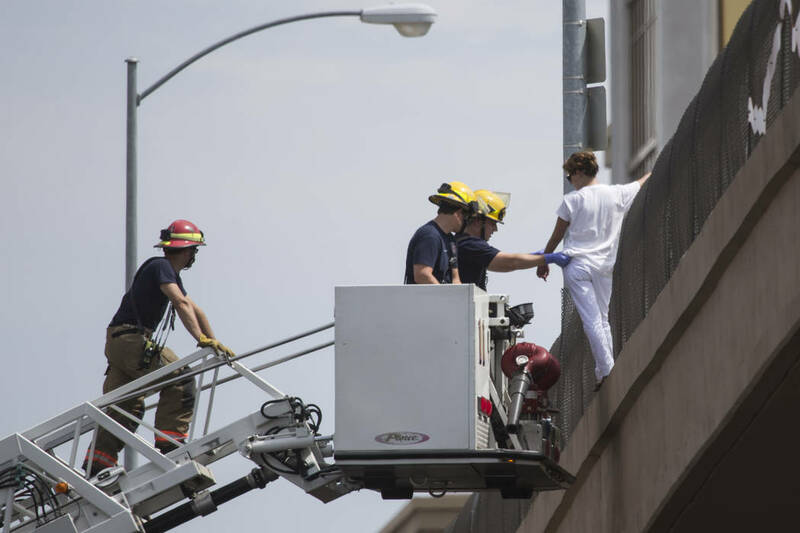 Erik Verduzco/Las Vegas Review-Journal A woman hanging off the Mandalay Bay overpass and above the northbound lanes of Interstate 15 is rescued by the Clark County Fire Department in Las Vegas on Monday, Sept. 4. 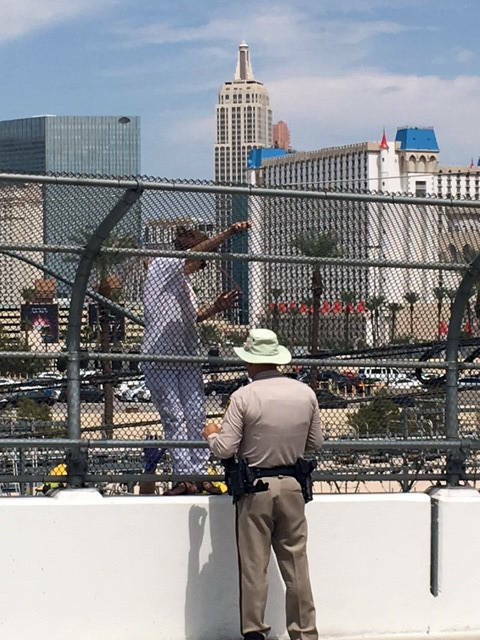 Valarie Vanario-Mullins Officer Timothy Mullins helps a woman who was threatening to jump from an overpass above Interstate 15 in Las Vegas. Erik Verduzco/Las Vegas Review-Journal A woman hangs off the Mandalay Bay overpass and above Interstate 15 in Las Vegas, on Monday, Sept. 4. After Metropolitan Police Department officer Timothy Mullins spent an hour talking to her, she was rescued by Clark County Fire Department using a fire engine ladder. “It was clear what her intention was going to be,” he said. The Boulder City resident spent an hour speaking with the woman, gaining her trust and convincing her to get some help instead. “I want to get her to see this from a different light … You’re trying to get them to believe you care about them, and that they’re a valuable person,” he said of their conversation. He said officers’ intentions in situations like this is to save lives and connect with them, so they know that “we love them and care about them.” It also gives the person time to think. After receiving a call on Monday about a woman “traversing” over the fence railing on the north side of the overpass above Interstate 15, Mullins and his partner responded immediately. Mullins, a field training officer with 18 years of experience with the police department, said he saw she was emotionally distressed and in pain. It also appeared that she was standing directly over the center lane of traffic on the interstate. He said his immediate concern was her being on the bridge and the possibility of her slipping and falling into the traffic. In addition to the heavy Labor Day traffic, there are also several busy traffic interchanges in that area. Mullins said the traffic was so busy he could feel the gusts from it on the bridge. Mullins and approximately 19 other officers got to work and stopped traffic so that contact could be made with woman. He spent an hour talking to her, trying to find out what she needed and gaining her confidence and trust. He even got her a bottle of water at one point. Once he was able to convince the woman not to jump, their concern turned to getting her down from the overpass safely. “Having her walk across it was not a safe option … Her heels at all times were hanging off the end,” he said. In order to be safe, the fire department was called in, and it brought a bucket truck to get her down. When all was said and done, Mullins said it was “heck of a collaborative effort” among the police department, members of the fire department and everyone involved. The 11-year resident of Boulder City said this type of situation is mentally fatiguing and traumatic for all the people involved. “You’re pulling every bit of training you have out of your brain to … build that trust,” he said. “You never want to say the wrong thing … You’re trying to be the best person for them. “I want to go home and rest assured that they’re good … and getting the help they need,” he added. For Mullins, he’s been in situations many times where he’s had to help someone change their minds about hurting themselves or others. “Working in the streets, it’s impossible for officers to not be involved in incidents like this … It’s not my first one, but I hope it’s my last,” he said. To help him cope with all the situations he brings home, Mullins relies on his wife, Valarie Vanario-Mullins. “She’s as good as you can hope for in a support group,” he said. Vanario-Mullins said she is glad to support her husband and hopes that his actions will help bring some positivity into the world. “If I can put a little bit of positivity in the world, it’s a good thing,” she said.